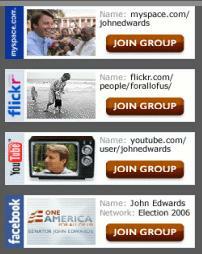 2004 Presidential candidate John Edwards is at it again. Seriously, he's running for president. This time he's using the power of the Internet to jumpstart his campaign with a video on YouTube. You might recall that Howard Dean parlayed Internet prominence into a seemingly viable campaign back in 2004 that ultimately fizzled out. Well, this time, with mature social media tools like MySpace, YouTube, Facebook, and Flickr around, Edwards might do better with his "Tomorrow Begins Today" campaign. Check out his website to see how he's utilizing them in spreading the word. Like John Kennedy's dominance of the presidential race by cutting a dashing figure using the then-new medium of television, might Edwards win in 2008 by adeptly using the web's new social tools?